My next post will be about my depression again. 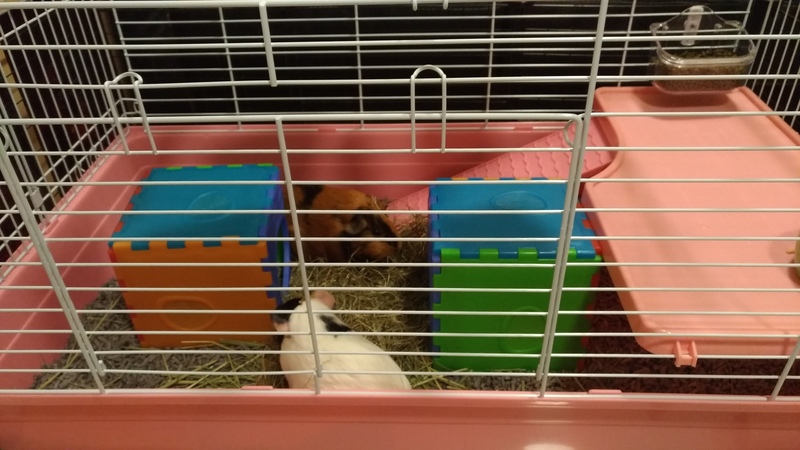 This post is reserved for the pigs – they’ve gotten a new cage! The way this came about was quite unexpected. 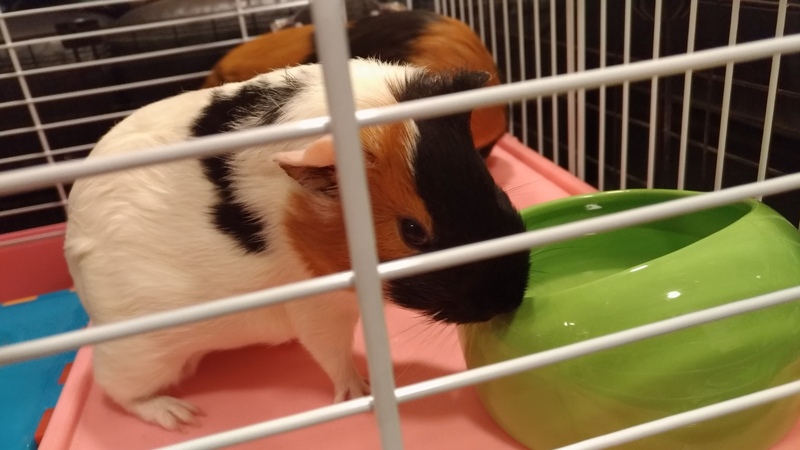 We saw yet another guinea pig that stole our hearts at Jurong East, and to show how badly we’d fallen for her, every time we went past the shopping center where she was, we’d drop by to see her. She was this lovely light brown colour with a sweet face, and a streak of white on her forehead. She was also alone, which made us consider whether to introduce her to our little family. We were worried, because the piggies had been snapping at each other more of late. Heart and Soul were still friends – they wanted each other’s company, and would not stray too far from each other, but they were snapping more often, and just more bad tempered. We didn’t know why, or what to think of it. Adding a new friend could make things better, or make things worse. So I prayed, and asked God to help us to make a decision. If the new piggy was to join us, please allow it. If not, please have someone buy her before we were ready. Then I jumped into research. The old cage was too small for three pigs, definitely. But as I did my research, an appalling fact came into view. 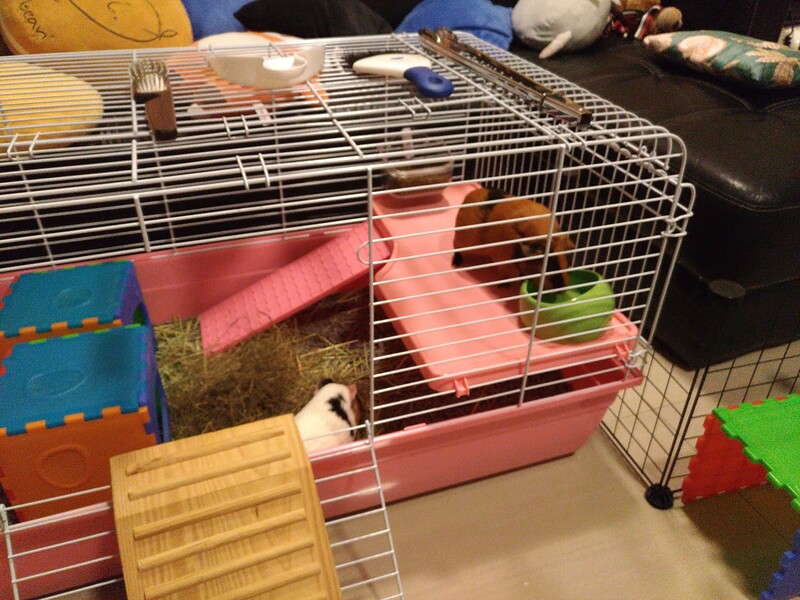 The old cage was also way too small for our two piggies. 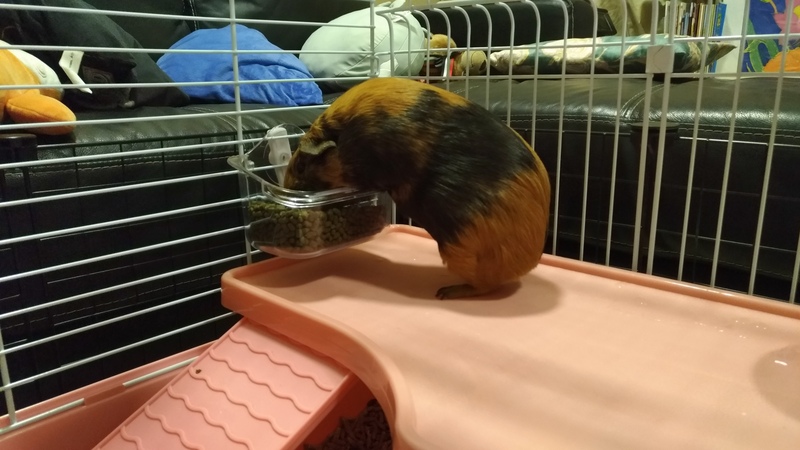 The ideal size was one square meter for two pigs, and while that’s impossible in a HDB flat with two growing boys, I measured the old cage and found that it was only 78cm by 46cm. That’s not even half of the space the pigs are recommended! We made up our minds to get a bigger cage. We started looking at some cages, but they were either too expensive, or had second floors that had steep ladders for rabbits and chinchillas. It’s easier to find a complex cage for hamsters than for guinea pigs! 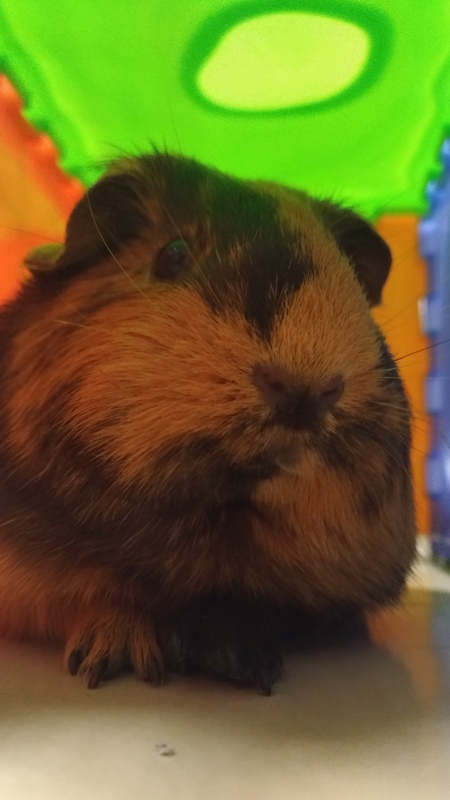 Guinea pigs also can’t live in cages with wire floors that rabbits can live in – the wire floors allow excrement to drop through to a tray below that can be removed and cleaned. The same wire floors cause piggy feet to develop the equivalent of piggy bunions that can cause pain and infection. By God’s grace, we stumbled across a SGD$140+ cage, with a small second floor and a wire-free (wireless?) ground floor. In the picture, the sloped ladder was also not too steep – pigs are reluctant climbers at best. We did worry that the pigs won’t want to climb, but my wife reminded me that they already like to hang out on the roofs of their little houses, which involves jumping up. So we bit the bullet and bought it (and got a small discount for the first online purchase from Pet Lover’s Center!) The new cage measures 100cm by 52cm – a significant increase in size. Our focus at this point was to make sure the girls could have enough space to run. The cage is where they spend most of their time even though we have a fenced off floor space because we aren’t always free to open the cage for them. It was a huge point we overlooked, though the original cage was alright when the pigs were younger as they were physically smaller. My wife was concerned about the amount of bedding we would end up using since the cage is so much bigger. I assured her we could start with a thinner amount to line the floor, and make do at first. So we made the order. That weekend, before the cage arrived, to our horror, we found that Soul had gained over 30 grams over a week. That may not seem like much, but she’s on the large side for a girl piggy. Girls are known to weigh anywhere from 700 to 900g on average. Soul isn’t much for running around, and she was already past 900g for some time. Gaining 30g is a lot for a week! The cage couldn’t come fast enough for us. When the cage was ready for them, the girls were puzzled and excited. They confined themselves to the bottom floor, and tried to push the ladder away. We’d already decided that the pellet box and the water bottle would be on the upper floor. Water is super important to guinea pigs so we were quite concerned when they refused to climb. I ultimately had to catch each of them, reluctant as they were, and force their noses into the water bottle before they realised where it was, and each took a long drink at once. From then on, they had no issue climbing up, though it took still a while longer before they realised there was a ladder. They just leapt up from the ground floor until they figured things out. We had another problem with the old setup. The girls don’t use their bottle very well – somehow, they drip as much as they drink, frantically biting the metal nib to get water even though it flows pretty well. Every day, I have to clear a chunk of soaked bedding, which was partly why my wife was concerned about the cost of bedding. Now that the bottle was on the second floor, the same problem was happening – but with no bedding to soak up the water. The floor was flooding, and when one of the pigs decided to drop a piece of poo, it was… not very hygienic. Or visually appealing. So we came up with a brainwave – to take an old water dish out of storage. Heart’s nose is quite pointed so we were concerned that she couldn’t drink the water without wetting the tip of her nose. But we tried it anyway and observed. I wish I could get a photo of her actually drinking. But every time the phone camera approaches, she stops what she’s doing. 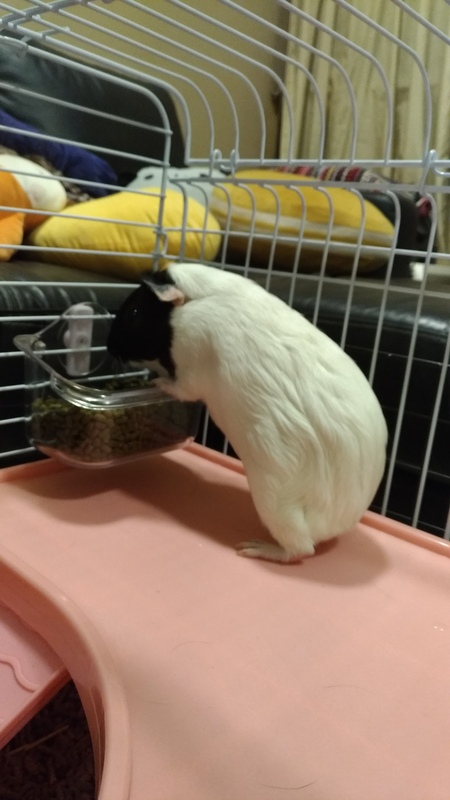 But yeah they love the water bowl, and while Heart still tried to frantically bite the porcelain for a bit to get the same effect as with the bottle, she’s stopped that by now. Dripping is a lot less, and while they get wet undermuzzles, that dries fast, and is more than acceptable. Anyway, the cage was settled, and the girls settled in well. With great joy, we noted that they immediately stopped snapping at each other, and were way more content to just spend time near each other under the second floor, in the covered area. Pellet eating and drinking was easier – no more having to stand high up to reach either the water spout or the pellet box. So we got some unexpected benefits. We didn’t realise that they were quarrelsome because of the lack of space. They’re less eager to run out of the cage when the gate is opened now, and they’re more peaceable. On the next day, when cleaning the cage, I found an additional surprising benefit – there were less pee-soaked spots around. On occasion in the old cage, I’ve observed – and gotten my hand soaked by – the girls spraying pee at each other’s faces to maintain their own space. The houses had pee spots I’d clean daily, and there were a lot of soaked spots, where they’d evidently had little battles to keep their own space to graze. But with the added space, there was no longer a need to do this. We’ve ended up using a lot less bedding overall despite the larger cage size. Normally we go through 6 sacks of bedding a month. Now I’m estimating 4.5 sacks. How’s that for an added benefit? How about the other pig? Well, after the girls had settled in, we decided we were more ready to answer the question of whether to add her to the family, but remember my prayer? When we went back to the shop, the girl had just been sold that morning. It was a clear enough answer to my prayer. So… How has God been kind? Without knowing that it was a problem, we solved a much needed problem of space (almost in crisis proportions – diabetes in piggies is a known problem!) and exercise. This week, when we weighed Soul, she lost 20+ grams and is visibly less round. The girls are gentler around each other, and we’re using less bedding. All this because of the prompting of a random sighting of a pretty guinea pig that wasn’t even meant for us. Our two girls are doing so much better because of it, and I’m sure God is wise to not let us bring in the third pig. See how small the pigs look compared to the cage? They aren’t any smaller in actual fact. They were just outgrowing their cage. I love how God solved this issue for us even though we didn’t know it needed to be solved. Our pigs are instrumental in keeping me alive and sane, just as my dear family is. The least we could do is to love and care for them as God allows. And Soul still looks healthy.